Oh man, drama alert! A couple of weeks ago, theBalm Cosmetics had what I would call a PR nightmare of a sale. The company was launching a new website, and decided to celebrate with a 24-hour 50% off sale on the same day as the new site’s launch. As someone who works in the web design industry, I have to say, that is the WORST idea I’ve ever heard. Talk about trial by fire! I actually felt very sorry for their web design & development team, as I am 100% sure having a huge sale on the same day as a new site launch was not their idea. Not surprisingly, the servers crashed immediately after launch, and the sale had to be postponed by nearly a week. In the meantime, theBalm’s Facebook wall was plastered with complaints from angry customers who couldn’t complete their purchases or were upset that the sale had been postponed. The kicker was that all of this happened on April 1st, making the whole debacle feel like someone’s really boring idea of an April Fool’s prank. I was one of the lucky few that was able to get my purchase completed before the site went down. I only ordered on thing, but that thing is really three-things-in-one, so I think I made out pretty good (also, can I get a prize for not going bananas with the sale spending?). 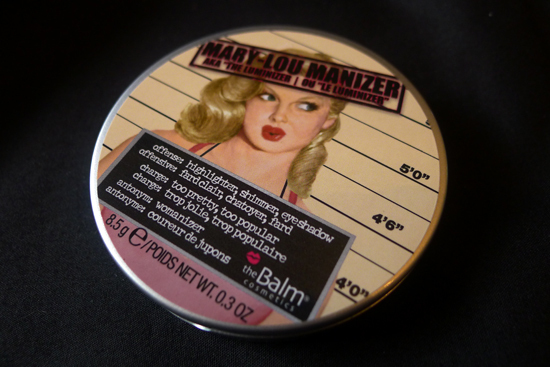 I purchased Mary-Lou Manizer, ($24, though I scored it for $12!) 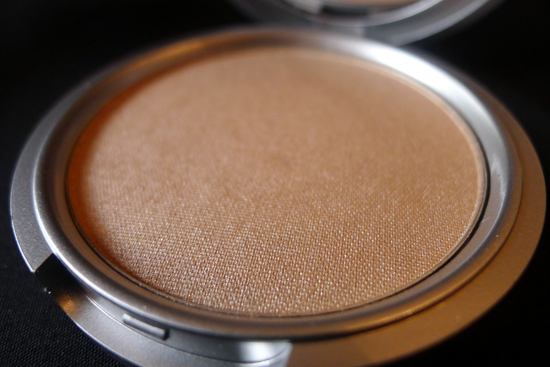 a beautiful highlighter-eyeshadow- shimmer powder-in-one. As most of you know, I love highlighters, and this one came highly recommended, so I’ve been wanting to get my hands on it for a while. The packaging is a bit too cutesy for my taste, but I think a lot of ladies will find it fun and appealing. They have the same kitschy, 50’s style cartoony thing going on that Benefit has with their packaging. The case itself is plastic and very sturdy, so I have no qualms about throwing this compact in my purse. My makeup with no highlighter. My makeup after adding Mary-Lou Manizer to the bridge of my nose and the tops of my cheekbones. Sorry about the hair. I’ve been housing rats back there. Overly cutesy packaging aside, the actual product is fantastic! It’s very finely milled, and although it looks nearly matte in the package, it has a fine, shimmery, glow to it when applied. 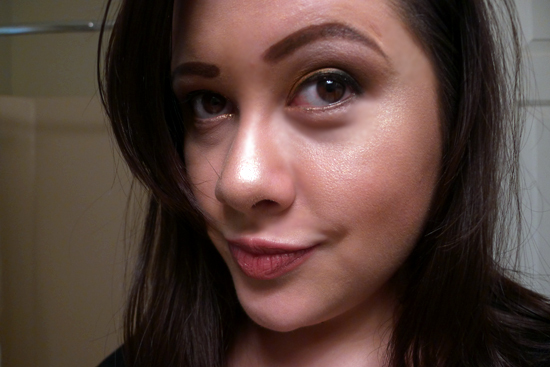 The shimmer isn’t obnoxious or glittery, but you will definitely want to blend this product rather than just dabbing it on if you want a true, dewy effect. 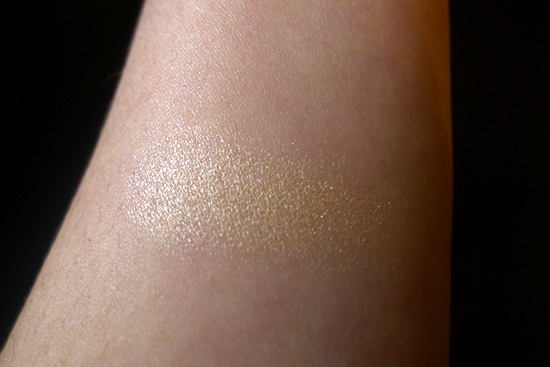 The color is a beigy gold, similar to the limited edition Heat Wave Gelée by Estée Lauder. This makes me happy because I love Heat Wave, but since it’s limited edition, I won’t be able to replace it when it runs out. However, this is a lovely, permanent, and much less expensive substitute. 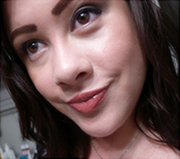 Mary-Lou Manizer is the swatch on the left. 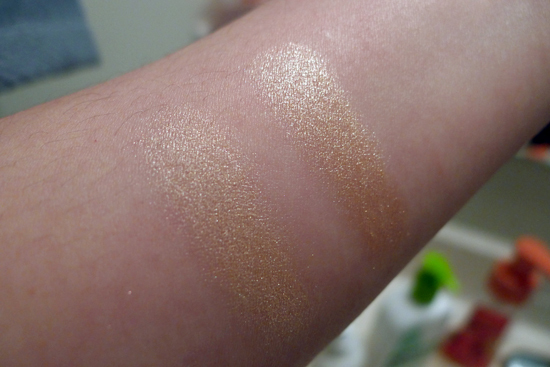 Estée Lauder’s Heat Wave Gelée is the slightly brighter swatch on the right. I also find myself using this powder quite a bit on my eyelids. 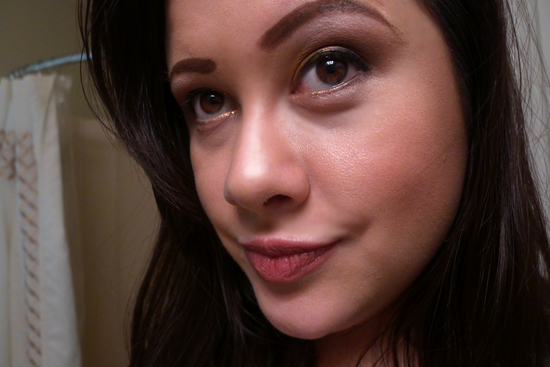 It makes a great, non-creasing eyeshadow, and the color is perfect as an all-over color on your lid if you’re in too much of a hurry to get crazy with your eye makeup. 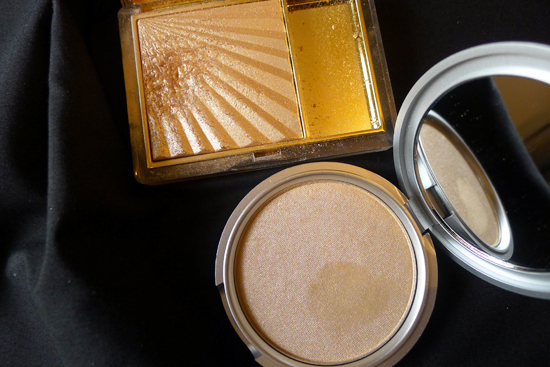 The packaging and website description indicate that this can be used as an all-over shimmer. That’s not really my jam, but if it’s yours, I think Mary-Lou Manizer would be nice and glowy without being too over-the-top. You can pick Mary-Lou Manizer up at theBalm website for $24, although there is an Amazon seller that carries this for $17 with free Prime shipping. Haha I love the drama alert! I was able to get in on the second round. I picked up the BalmJovi palette. Can’t wait for it to arrive! Mary Lou looks gorgeous on your skin! On mine, it’s kind of disasterous. I prefer it as a shadow, like you were saying. That BalmJovi Palette looks fantastic! I can’t wait to see your swatches for it. What happens to Mary Lou on your skin? Is she glittery?